When my girls were little, especially the younger one, I knitted finger-less gloves for them. The first pair was something of a fluke, actually. I was knitting socks and shortly after finishing a cuff, I was sick and tired of knitting socks. 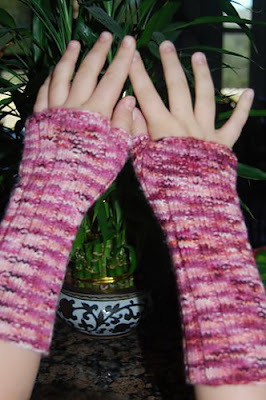 After I put them down, I noticed someone on Ravelry published a pattern for these cute little mitts. While reading the pattern, I realized it was almost identical to the socks I no longer wanted to knit. So, I made mitts out of them. This was ten years ago, and Wee One was delighted with them. Well, those are all long gone now, but I noticed on Instagram that someone posted a pair of finger-less mitts made from handwoven fabric. They were gorgeous and something I would certainly don on chilly days, as I hate to have cold hands, but never wear gloves. A quick search of sewing patterns led me to this. I downloaded it and printed it out twice, so I would have a jumping off point to design a pair. I also wanted to lay them out to determine how large a piece of fabric I would need to make them. As I was crunching my numbers, it occurred to me that a matching cowl would make a lovely set for gifts. 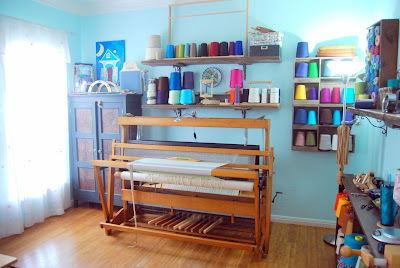 My plan is to use 8/2 cotton in a gradient of colors for the warp and 5/2 bamboo for the weft in solid colors. 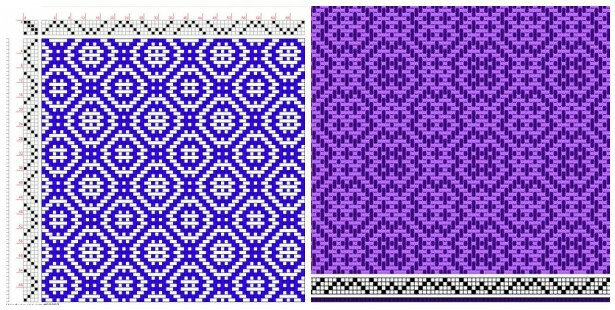 Instead of plain weave, I thought a nice geometric pattern would be attractive; however, as Lil Miss still only has 4-shafts, I needed to restrict my search to 4-shaft patterns. Fortunately, I think there are more 4-shaft patterns than any other. 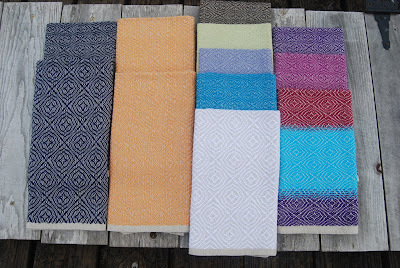 In fact, if I limited myself to 4-shaft patterns, I do not think I would run out after a lifetime of weaving. Anyway, I made a project page in Ravelry and began uploading photos of drafts that were potential contenders for the mitts and cowl. I poured over hundreds of designs and came up with three. After I studied the three, I realized two were actually the same design, but in different colors with one using a rising shed tie up and the other using a falling shed tie up. In essence, one is a positive and the other is a negative image of the same design. Which means, of course, that I have found the design I will use!